The Embrace Pocketed Mattress is one of the many offerings from Metron, We spend one-third of our life in bed, approximately 8 hours of sleep per day. Our physical, mental and emotional performances are all directly correlated to the quality of sleep you are getting into. The quality of our mattress drastically hit hurt -impacts the quality of your day-to-day activities, so it is very important to have the best mattress possible for your overall well-being. Good health requires healthy sleep, and that’s exactly what we provide.To help you overcome the stress in life we introduce the Embrace Pocketed Mattress. 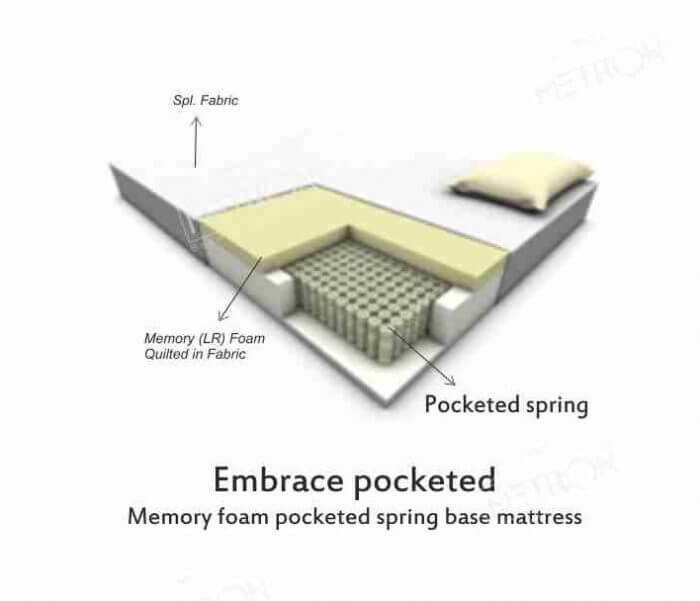 The temperature sensitive and pressure-relieving memory foam and the second layer pocket spring arrangement has several advantages. They conform to the shape of the body, preventing concentrated pressure points, thus maintaining steady blood circulation. This reduces tossing and turning to a large extent. These pockets also absorb weight & compress independently. Hence, if any one person changes sides, it will not disturb the other person on the mattress. The mattress comes with foam wall Technology for a superior edge.